How specific can you be in targeting demographics or geographical areas with a PPC campaign? Targeting ads is essential to the success of paid search, as you want to ensure that your ads are being viewed by the right people. You can target specific demographics – including age, gender and parental status, and specific geographical areas – by choosing a country, region, city or postcode area where your customers are located or show an interest in. As well as targeting these factors, you can also target them in combination with other segments – making PPC campaigns specific and customised to specific audiences. How is CPC (cost-per-click) determined? As bids are determined on a one-by-one basis, depending on a number of factors including competition and quality score, the CPC varies. This is because the cost-per-click is always a discounted price from your maximum CPC, meaning you only pay the least amount required to beat the ad rank of the nearest competitor. This means that the average CPC is used, which is worked out by dividing the total cost of clicks by the total number of clicks. Why set up a Shopping Campaign? Many businesses experience an increase in click-through rate (CTR) due to setting up a Shopping Campaign, therefore bringing more people to your website giving them the opportunity to convert. The clicks from Shopping Campaigns are likely to be of a better quality to clicks from search engine campaigns, as by viewing the shopping page they show the behaviour of users who are more likely to convert. Shopping ads give your business more opportunities to appear on searches. By combining a Shopping ad and a text ad, your ads will gain more impressions and the chances of conversion are higher. How do you determine keywords for PPC? At the beginning of a campaign, keywords are determined by words or phrases which are relevant to the campaign – and more specifically – relevant to the ad group. These can then be used for your ad in a variety of match types including exact, phrase and broad match modifiers. 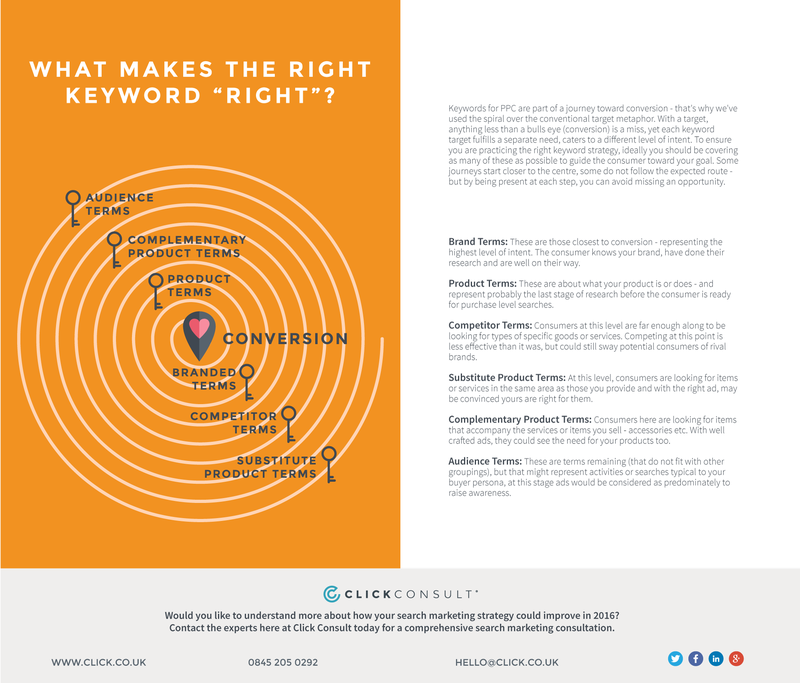 Keywords can also be determined by Keyword Planner – which is a Google tool used for building new campaigns or expanding existing ones – giving you keyword and ad group ideas, historical statistics and performance predictions of keywords. As you’re reaching out to people who have already interacted with your business, these people are the most likely to convert at a later date. By customising remarketing lists, you can create messages specific to audience activities. For example, a “shopping basket abandoners” list to show ads to the people who have added something to their basket but didn’t complete the transaction. Remarketing can be a cheaper way to convert additional customers as, generally, CPC can be much lower on remarketing. Our remarketing cheat sheet tells you more. How can our Quality Score be improved? How quickly can I get my campaign started? It takes 5 to 10 working days to get a campaign started at Click Consult. This is dependent on a number of factors including the campaign you want, the amount of ads needed, whether your website landing page matches the ad copy and your past account performance. You also need to have a set budget and KPIs in mind before beginning your campaign in order to track your spending and measure ROI. Why not let our experts to carry out a free, no obligation-free PPC review for your business?